W hen I was nine, I moved from rural Maryland to a small town in northeast Georgia. From the outset, it was obvious that I was different from the other kids. I wasn't "white" and I wasn't "black." But at the time, "South Asian" was not an available box to check off when identifying myself. I also wasn't Chris- tian. One might presume that being a minority (in religion and race) in a place like Toccoa, Georgia, would have a negative effect on me. In fact, it helped me appreciate my heritage and want to share my culture and story with the curious community I found myself surrounded by. This ability to be comfortable being "different," to connect with people—and to accept the curiosity of others and reciprocate that curiosity—is what led me to be a journalist. As a media professional and diversity practitioner, I believe that diversity and inclusion are not a business division—they're everyone's business. 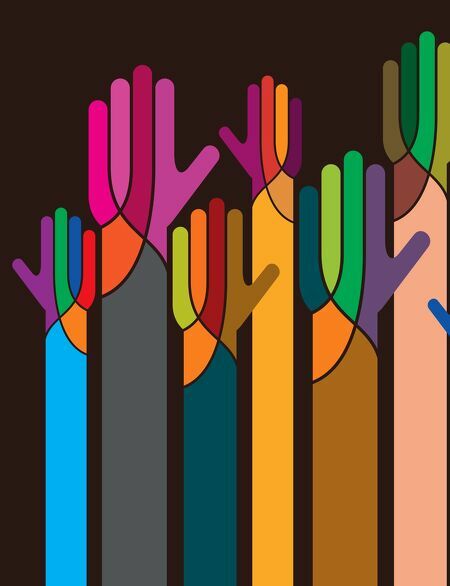 Here, we celebrate some of the many individuals who are re(thinking) diversi- ty and how it applies in their own field. Whether they are creating talent pipelines, bridging gaps, or sharing stories of diverse people, their ability to appreciate and leverage their own diversity, and that of those around them, makes each a key asset to their organization and the communities they serve and represent. They see and promote diversity of thought in all that they do and understand its value in our increasingly connected and multicultural society. 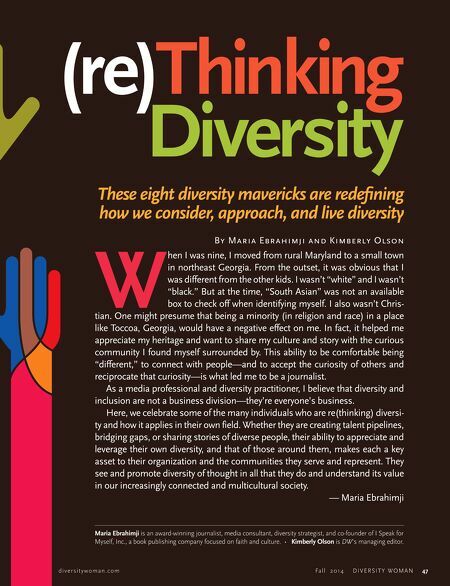 — Maria Ebrahimji These eight diversity mavericks are redefning how we consider, approach, and live diversity By Mar ia Ebr ahimji and Kimberly Olson (re)Thinking Diversity d i v e r s i t y w o m a n . c o m Fa l l 2 0 1 4 D I V E R S I T Y W O M A N 47 Maria Ebrahimji is an award-winning journalist, media consultant, diversity strategist, and co-founder of I Speak for Myself, Inc., a book publishing company focused on faith and culture. • Kimberly Olson is DW's managing editor.